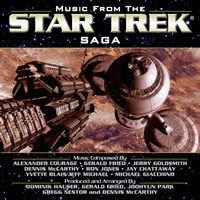 BSX Records presents a brand new collection of freshly recorded and arranged Star Trek music in an album aptly titled Music From The Star Trek Saga. The 18-track collection brings together music from every generation of Star Trek, covering all TV series, a selection of the movies and - of interest to many fans - the Animated Series. The majority of the music has been newly produced and arranged by Dominik Hauser and features an array of talented performers including Original Series composer Gerald Fried who contributes a memorable medley of classic TOS music. The inclusion of the Animated Series theme is bound to please a multitude of fans who have been hoping to get the music from the short lived TOS spinoff for a long time. As we've previously covered in interviews, the original music is thought to be lost but thankfully that hasn't stopped BSX and Hauser producing a brand new recording of the catchy theme.